Get ready to go krazy! 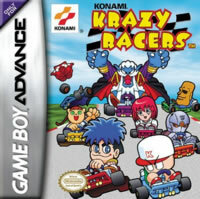 Konami Krazy Racers has the distinction of being the first racing game released on the Game Boy Advance in North America when the system launched on June 11, 2001. (Japan and Europe also received Top Gear GT Championship on launch day, but that's not a kart racer, and nobody remembers that one anyhow.) Despite the overarching commercial success of Mario Kart: Super Circuit, to which I can make countless comparisons, it's arguable that Konami Krazy Racers is the superior game. And to that end, I'd argue. Similar to the ever-popular Mario Kart series, Konami Krazy Racers pits eight characters (plus four additional unlockables) culled from the vast Konami IP library against each other in a driving match to victory on the tracks. Each of these characters has their own weight, acceleration, and speed statistics; depending on the courses ahead, some racers are more suited for the tracks than others. For players outside of Japan, the roster may seem a bit of a noodlescratcher, as some of these characters aren't among their flagship series overseas. Characters such as Goemon and Ebisumaru (of Mystical Ninja fame), Castlevania's Dracula, a cartoonified Gray Fox from Metal Gear Solid (renamed "Ninja"), and possibly Vic Viper and the Moai from Gradius may ring a bell in the mind of the average gamer, but the others are more likely to be unfamiliar. Takosuke (the octopus from Parodius), Power Pro-kun from Konami's MLB Power Pro series, and Bear Tank from Rakuga Kids are a few examples of entrants that may be just another face in a crowd of racers. Though, to be fair, Bear Tank looks downright odd. Think of the name "Bear Tank", and then imagine the OPPOSITE of what you're probably picturing right now. That's Bear Tank. This game must have taken some heavy inspiration from the Mario Kart series, specifically Super Mario Kart, because one could consider it to be a copycat of sorts. And on fairly close inspection, that arbitrary third-person "one" would be right. After all, you're scooting around on a Mode-7 track against up to seven other racers, picking up items along the track and using them to your advantage, such as homing rockets, kart boosters, and even the dreaded shrinking item to make all other drivers smaller (though in this case, they get turned into pigs briefly). 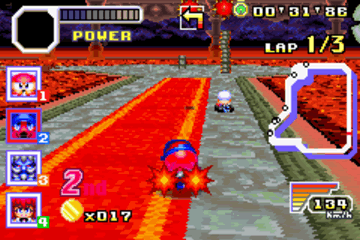 The Grand Prix mode of the game — is divided into cups, each of which offers four tracks, all based on Konami properties with their own little quirks and obstacles. The game doesn't let you tackle all of the cups at once, though. In fact, only one cup, the Krazy Cup, is available from the start. To unlock more, you have to successfully earn Licenses, done by completing challenges. And I call them challenges because they are, at times, quite challenging. A B-class license gets you two more cups, and the A-class license (achieved via a lot of hard work) unlocks the last one. Upon getting first place in the last cup, you get the option of earning an S-class license. They're rather sadistic, mostly because they take place on Cyber Field 2, the most dastardly and unfair of courses, and will cause your Game Boy Advance to fly hurdling into the path of an oncoming city streetcar. Other modes in the game include the obligatory Time Trial for setting records and impressing yourself, the Free Run (essentially practice for taking on the Krazy GP), and a couple of Mini-Battle games that may tickle your fancy. "Bomb Chaser" is basically a game of tag, except whoever is "it" has a bomb strapped to them, playing out like a bad karting rendition of Die Hard with a Vengeance. "Chicken" is a bit more unusual, where you are expected to sprint down a 400-metre course but stop as close to the finish line without going over. 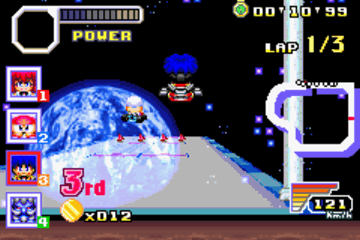 Like Mario Kart, this game also has a multiplayer mode accessed via the Game Boy Advance link cable for up to four players at once, where you can race or take each other down a peg in the battle modes. There's also a "Rumor Billboard" where you can read emails and messages posted by fictitous characters about how you should always try to get in first place and how you're awesome for getting a new license. It's a distraction. But here's the kicker: between Konami Krazy Racers and Mario Kart: Super Circuit, both on the Game Boy Advance but the latter released mere months later, I like this one more. A lot more. So, um, where exactly are they racing? In space? In a volcano? The zoning laws weren't written for this! Above all else, the controls feel much more natural. Granted, they are quite the same: A to accelerate, B to brake. And the L-shoulder button uses items. The D-Pad directs you, as expected, but you know what? That's it. That's all you need to know, really. Konami Krazy Racers does NOT feature a powerslide move at all, and although for some kart racing enthusiasts, that may be a shock, I find it a bit relieving that I needn't worry about this. As a likely intended result, the track layouts are less sadistic and less riddled with flurries of U-Turns and other junk angles. In fact, only one track in the game features any turns of this kind — including a 270° twist — but even that feels more manageable than Mario Kart: Super Circuit's vile horseshoes from Hell. Even the music is catchier here, perhaps attributed to a nostalgia factor. Classic tunes from Mystical Ninja Starring Goemon, Castlevania, Parodius, the aforementioned Antarctic Adventure, and Metal Gear among others all make an appearance, although the track from that last game reminded me far too much of the Cheetahmen theme song. But this all pales in comparison to what may be the greatest auditory moment in Game Boy Advance history: the theme song. In Japan, this game is known as "Konami Wai Wai Racing Advance", and thankfully the localization kept the awesome theme song intact. With actual voices singing "Wai wai, wai wai, wai wai raciiiiing" and some wicked M.C. saying "All right! ", this catchy little number draws you in like possessed quicksand. If there is a downfall in this game, it may just be the graphics, but even then, it's not a major concern. I shouldn't expect visual miracles out of a launch title for any console, especially for a handheld, but goodness, you couldn't make the driver sprites not look overpixelated? They're the one thing that are consistently in view in the same spot for the entire race, and they still require some slight zoom? I noticed this outright while racing as Goemon, but the others have it, too. It's not such a big deal in play, but it's the little touches the make the difference. The game otherwise looks pretty good as a whole; it's rather cute, to be honest. I did also appreciate the transparency of certain tracks, even if it was a minor effect. Now you may still shrug this off as just another kart racer in the bunch, and I can accept that. You're no longer on my Christmas card list, mind you, but I can accept your opinion. But after playing Mario Kart: Super Circuit and Konami Krazy Racers back to back, I am thoroughly convinced that Konami Krazy Racers is, hands down, the superior option. Attribute it to the simpler controls, the hip theme song, or even the quaint Konami fan service, but I have to admit, it was, simply put, the more enjoyable game.